What do you need a Function and a bio for, just buy this cool toy, kids! So, Robots In Disguise, eh? No, me neither. I think this is the first time I've been indifferent to the launch of a new Transformers cartoon/ toyline. Maybe because I'm growing up (finally), or just because, I dunno...I'm a bit burnt out by having another round of an all news series that'll be as fleeting as snow, filling time before the next film comes out. Not helped, it has to be said, by Hasbro's confusing product marketing. Most of the Robots In Disguise toys have been brought out in a similar vein to last year's Age Of Extinction toys – a bewildering array of the same five or six characters available in different price points – from Quick Step Changers, nonsensical Quick Attack toys, Legends scale toys, 'proper' Deluxe sized figures and an even more confusing mess of product once you get to the Leader Class, where things look very Fisher Price indeed. All with the same trade dress, so no one can tell anything apart and you can't collect them all! ™ in any scale. Brilliant. Whilst I'm no trade analyst and have nothing but the evidence of my own eyes, the 2015 Robots In Disguise line does seem to have foundered somewhat with product sitting unloved on shelves up and down the land. Super market Asda has had the Quick Change toys on two for �10 for most of the year, and no one seems to be biting. Hardly suprising, as even at �10 for two, those things are just the worst shizzle ever. With shelf space dominated by the cheaper end of the product range, the regular Deluxes have struggled to get a look in anywhere, and with them retailing at the same silly money as today's Combiner Wars Deluxes, its not hard to see why a lot of places have passed on the opportunity to try and shift a 5” toy that retails for the best part of �20 during a period of flat – if not negative – economic growth. Who's going to pay that money for these things? Especially when you have the product in hand and can feel how little substance there is to it. Needless to say, the only reason I picked up a couple is because Morrisons just gave up with the things and have recently cleared out all their Transformers toys to make room for Star Wars, which might actually have a chance of selling to someone. 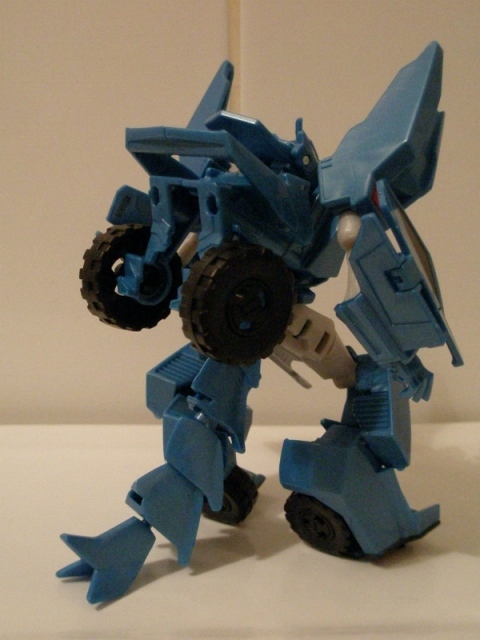 Steeljaw is the token Decepticon released in Wave One in all scales. 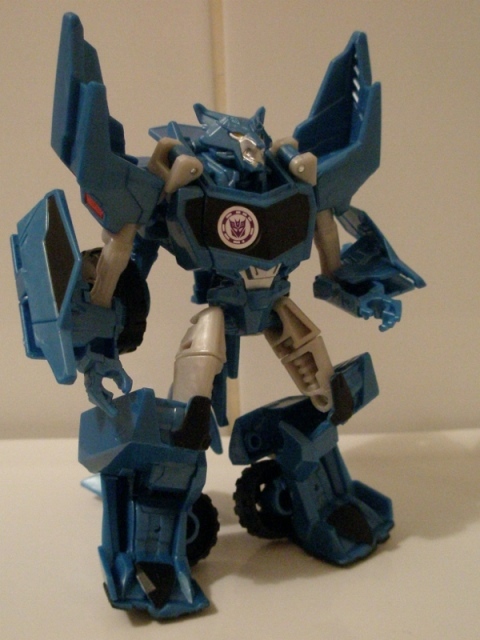 As many of us older fans have been wont to point out, Hasbro have largely moved away from trying robots-to-animals for Transformers for ...reasons, to the detriment of any variety, so its nice that Robots In Disguise has brought some of these stylings back by making the bad guys anthropomorphological animal characters...that turn into trucks and other vehicles. It's a nice design tick of the line, and its a bit of a shame the only real plastic representation of it has been Steeljaw here. Its not even funny now, Hasbro. Seriously, where are all the Decepticons? Its either one thing or the other with a lot of fiction, isn't it? Spider-Man and Batman have an army of bad guys, whilst The Avengers have um, Ultron and uh, that's it … and this seems to be how things are developing in Transformers. An army of tooled up Autobots ready to do some serious damage, with all their weapons and machismo and powers and general powerful supreme awesomeness.... and then, standing against all their imperialist might is, uh, one guy with wolf head and one of those silly 'bear claws' kitchen utensils so you can do your own 'pulled pork' like you would wont to do if you're a bearded hipster with stupid ear holes, too tight trousers and insufferable tattoos, running one of those bloody craft ale bars that has a cute name and weirdly sells bits of carcass to accompany your over-priced beverage and there's vinyl on the wall because, like, its sooo retro and coool and, like, once a month we have a vinyl night and you should totally come because its amazing. 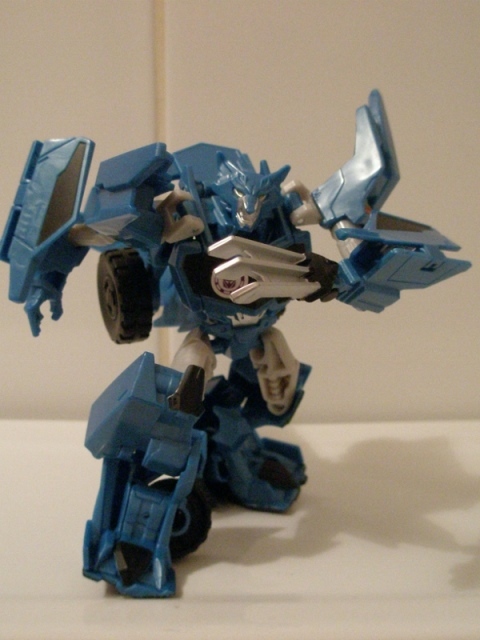 Robot Mode: So Steeljaw has a nice angular look to him. He's all jagged edges and wolf-head fun times. The truly cheap and plain plastics rob the toy of anything that might make him a bit more visually interesting. His face is smothered in silver paint, so a lot of the subtleties in face – the snarl, the teeth, the angry glare – are utterly lost and its down to Hasbro's faithful standby, the ever awe-inducing boring grey plastic to break up the endless parade of blue. Some apologetic black used on the windscreen helps give some life to the chest, but if those were my feet, I'd be seeing a doctor about that. The arms are a bit weedy, but all the car parts kind of cover this up, so it doesn't look as daft as it might. I have a hard time with the legs, as they're just a little bit too restricted to make Steely stand very well – or naturally. Do like the big serrated tail that he has though , which is a fun piece of design - and practical, too, as it gives him some good stability in robot mode. 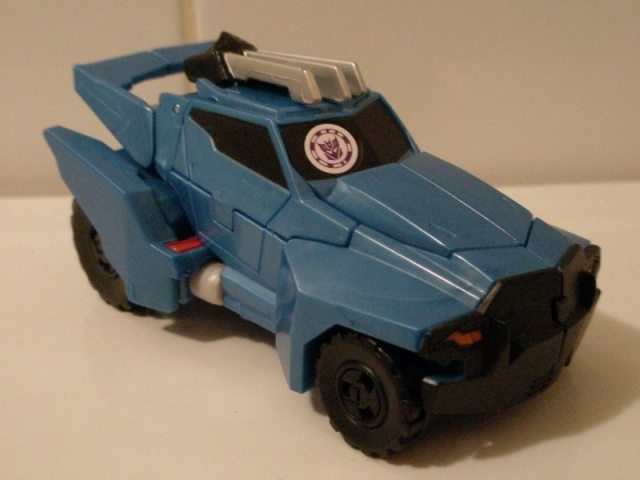 Alternate Mode: In vehicle mode, Steeljaw is a sort of van/ truck thing that's shaped like a Wolf's head. Its nice, but in no way realistic, and reminds of some of the weird stuff Hot Wheels turn out. I like how neat this makes it look, with the back end having this sharp, straggly look to it, which whilst looking unfinished, gives the look of animal fur. The front end is nice and sharp and pointy, like a snout. The windows seem to be glaring at me. Or they would be, if it wasn't for the scannable Decpeticon logo. He rolls okay, but makes the same awful, grating arthritic clatter that all Transformers toys do these days, which is just something I'm trying to live with now, as I don't think Hasbro will be improving their manufacturing processes anytime soon.